As you know, board members, key volunteers and senior staff play an important role in fulfilling the mission of your organization. However, even the most successful development offices can forget to utilize these people in their efforts to build relationships with donors. 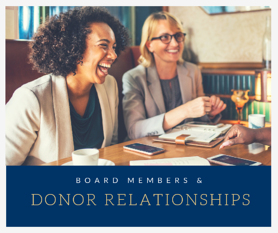 Through the next several blogs we’ll look at some simple examples of how this can work and why these team members can be an integral part of helping you build successful and lasting donor relationships. Board members are like everyone else—they’re people. And most people don’t like the idea of “asking for money.” That’s nothing new. What might be new is to approach this topic from a slightly different angle with board members. Ask them, “What have you found is the best way for you personally to build a relationship with someone?” Their answers might surprise you. A few months ago, I had lunch with a client (an executive director of a camp) and one of her board members. We started talking about why the board member had agreed to serve on the board. The board member shared stories about her experiences attending summer camp as a teenager—stories about how she was challenged to think differently, challenged to make new friends and challenged to examine her perceptions of others. These experiences profoundly impacted her life. She went onto share that she wanted other young women to have similar experiences, and that was why she was on the board. We went on to talk about people she knows who also value camp ministry. The list grew and grew. Then we explored how she and the executive director might be able to connect with those people, given their shared interests. At the heart of any authentic donor relationship is a common connection. Nothing more, nothing less. At the end of the day, people give because of relationships. I encourage you to invite your board members to help you build those relationships! Questions or comments? Let’s connect! Have a thought, question or example you’d like to share? Please use the comments area below. If you’d like to discuss ways to engage your board in building authentic donor relationships, please reach me lons@designgroupintl.com.